The heavy doors to the big back patio swing open, and a warm ocean breeze sweeps through. Stepping out of the cool, air-conditioned art deco lobby into the humid and sunny morning, the smells of espresso and Cuban cigars greet us. A few of our travelers are seated around the coffee tables sipping a last-minute morning coffee before we head out for a full day of cultural immersion activities in Havana. We are on a 10-day journey to Cuba. 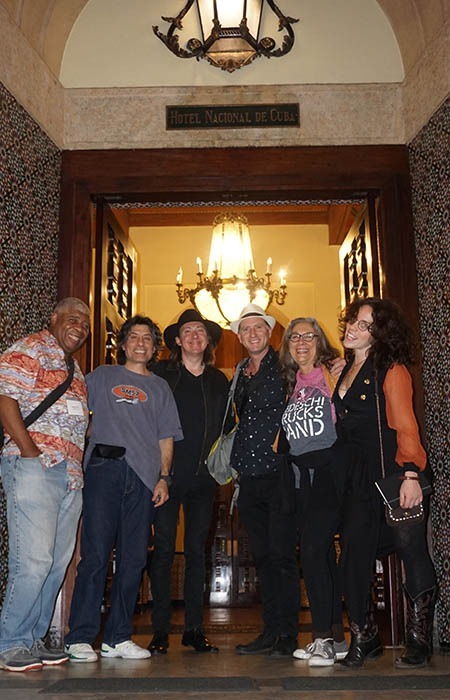 Our Music and Photography trip with legendary Blues guitarist Taj Mahal and Seattle-based photographer Linda Wolf has brought 40 like-minded people together to explore the roots of Cuban music, meet talented musicians, and learn to capture this beautiful country through the lens of a camera. The photo opportunities are countless! 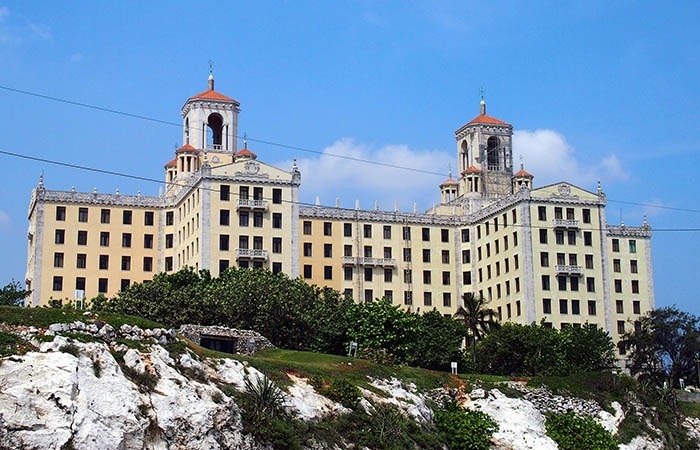 One of Havana’s most sought-after places to stay, the Hotel Nacional was built in 1930. Today it is owned and run by the Cuban government. There are more touristy hotels in Havana’s classic Old Town neighborhood, joint ventures between the Cuban government and hotel chains from Spain and Canada dating back to the early 1990s, when Cuba began to aggressively expand tourism as a way out of the economic crisis that followed the collapse of the Soviet Union. Centrally located, just a block from the famous Malecón waterfront in the Vedado neighborhood, the Nacional is the jewel in the crown. With more than 450 elegant rooms and suites, it is filled with visitors from all over the world. Hotel Nacional is within walking distance from many famous Havana watering holes like the Jazz clubs La Zorra y el Cuervo and Club 23. The Vedado neighborhood is where many Cubans live and work. Bustling sidewalks are filled with residents and workers from the wee hours of the morning until long after dark. Warm winds from the Atlantic ocean sweep in like lullabies to slumbering embracing couples. Havana is easily one of the most romantic settings on this planet. It takes your breath away, and your heart beats a bit faster there more than anywhere else in the world. Entering the hotel, the grand arches and mahogany doors immediately take you back to an era more than 60 years ago, when famous artists, musicians and actors like Ernest Hemingway, Errol Flynn, Clark Gable and Rita Hayworth frequented the bars, swimming pools and gardens of this pleasure palace. 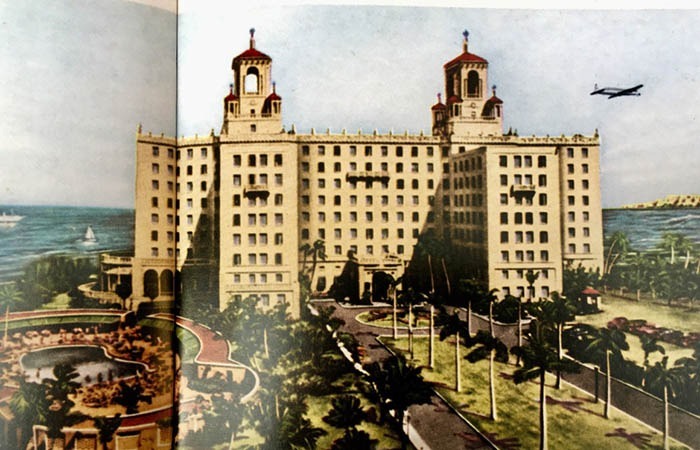 Fulgencio Batista, the brutal U.S.-backed dictator who was deposed by the revolution in 1959,had allowed mafiosos like Meyer Lansky to control Havana’s lucrative hotels and casinos, contributing to widespread corruption and prostitution. In the countryside, abuse and neglect of the rural population inspired Fidel Castro and his band of rebels to overthrow the government in 1959. Many of these events took place in and around this legendary hotel, and the whispers of this era can still be felt around the property. Today, the hotel plays host to thousands of visitors throughout the year. Just a short stroll through the warm breeze on 23rd Street (Calle 23, or la Rampa), we find Coppelia Park, the famous modernist ice cream palace built by Fidel Castro in 1966 to share his love of frozen delights with the Cuban people. It was the setting for the 1993 film Strawberry and Chocolate, the first Cuban movie nominated for an Oscar as Best Foreign Language Film. The film tells the story of a gay Christian Cuban writer who falls in love with a communist revolutionary student half his age. Something about that movie made my heart sing. When I saw it, I knew that my first love affair with Cuba had begun, little did I know it would keep coming back into my life. 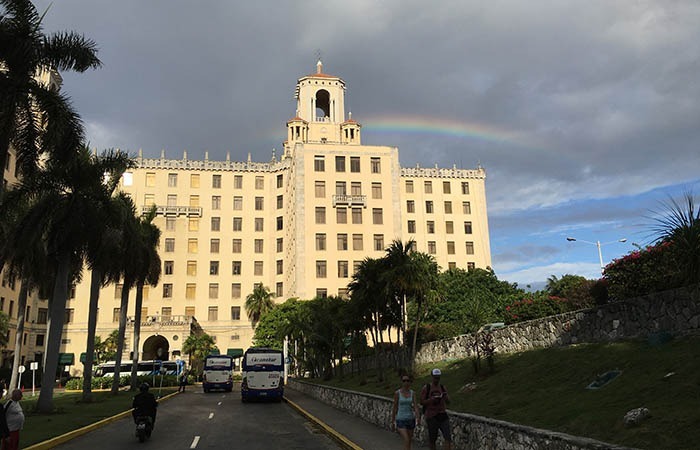 During the film festival, we stayed at the recently-refurbished Hotel Nacional. Cuba was still in the depths of what Fidel Castro called the “Special Period”, when Cuba’s economy collapsed as a result of the fall of the Soviet Union in 1991. Without cheap oil or food imported from its former communist patron, Cuba had to retool its economy almost overnight, shifting from its old role as the sugar mill of the Soviet bloc, to promoting tourism to Canadian and European travelers. It was an exceedingly difficult time for the Cuban people, who were not allowed to set foot in the tourist hotels, out of fear that mixing with foreigners might infect them with counter-revolutionary ideas. With our own eyes we watched Cubans being firmly but peacefully escorted out of the hotel. During these difficult times, prostitution had returned to the hotels in force. While prostitution still exists elsewhere in the city and other parts of Cuba today, this is no longer the case at the Nacional. Now, there are many more American tourists present, but structurally, the hotel has not changed much in the 20 years since I first stayed there. The vibrant Cuban spirit is still very present. Our guides come out to fetch us in the courtyard. We finish our espressos. The buses are waiting for us. We all pile on, look around to make sure we are all there. The buses turn down toward the intersection of 23rd Street, and steer left towards the Malecón. The morning is hot, and the waves are starting to crash over the 8 kilometer seawall. Across the wide waterfront boulevard, crumbling facades of Central and Old Havana yearn toward the jet blue and turquoise ocean. There, 90 miles to the north, is Florida. So close, yet still, in 2016 after all these years, so far away. A cruise ship approaching in the distance signals that a new era is moving in. What this will bring, nobody really knows yet. In the meantime, my love affair with Cuba is still as hot as ever. Great text Cilla !!! Besos y mucho amor from the wild documentary film maker.